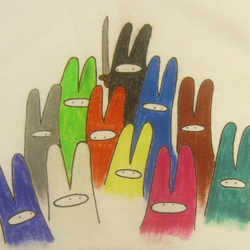 Limited edition screen printed t-shirt. Get creative by colouring it in, making it 100% unique. 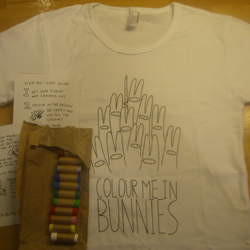 Each T-shirt and comes with a pack of 12 coloured fabric crayons plus instructions on how to use. Girls are made from high quality American Apparel and boy tees are Cotton Hanes Beefy. 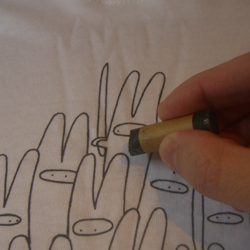 There is a limited number of t-shirts for each size so buy early before stock runs out. For sizing info see ladies size guide and mens size guide. Additional photos can be found on Flickr, please email me any of your photos to have them added.